This grilled strip steak with homemade marinade is easy and delicious! 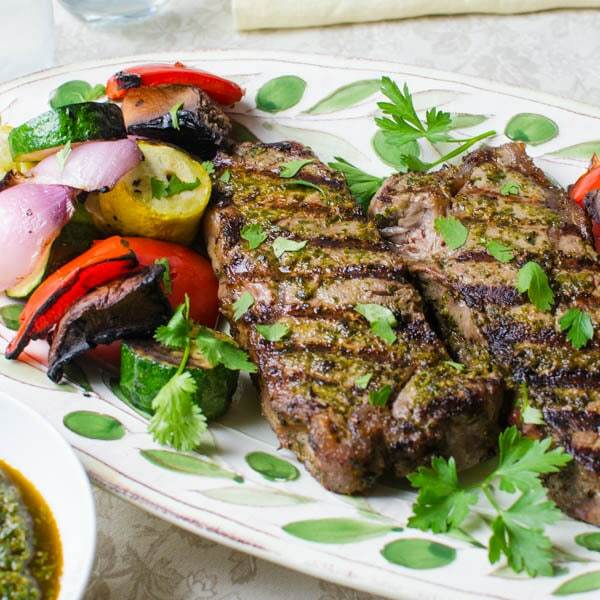 I use a smoky chermoula sauce as a New York strip marinade for mouthwatering Grilled Chermoula Marinated Strip Steaks. According to the thermometer, here in South Florida, summer has arrived. It’s like someone turned on the sauna. Everywhere else across the nation, people are finally coming out of their winter hibernation and drying off from the dreary wet spring weather — that calls for a celebration, right? 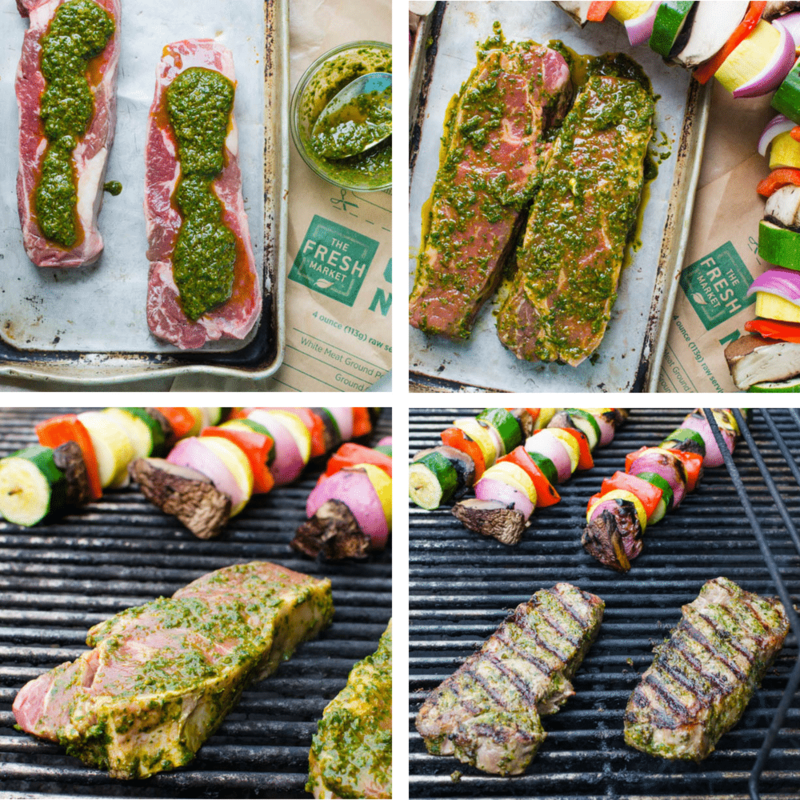 Grilled Chermoula Marinated Strip Steaks. Fire up the barbecue, this is gonna be good! I cannot believe we’re almost to the start of summer. I mean, Memorial Day is practically here. For most of us that means, relaxing, sipping cold drinks and grilling something fabulous — and easy. Nobody wants to put in a lot of effort when the mercury is nudging 90°, that’s why I stick with simple menus that pack a lot of flavor and I’m not opposed to taking a shortcut or two. The Fresh Market can help me with all of that and more… and the store displays are so beautiful and inviting, it really elevates your shopping experience. The Fresh Market is literally right down the street from my house – less than 1 mile away and it’s got the trifecta convenience of location | quality | variety that make it my first stop for summer grilling favorites. From seasonally fresh produce to exceptional meat and seafood, signature baked goods and carefully curated organics, all the foods you love are waiting for you at The Fresh Market. To kick off our grilling season, I’ve decided to go with something simple, but outrageously flavorful, grilled chermoula marinated strip steaks! Not just any strip steaks – USDA Prime strip steaks. I sometimes have a hard time finding Prime beef elsewhere, but I can always find it at The Fresh Market. While I’m there, I picked up some ready made vegetable kebabs to go with the steaks for ease and convenience — they did the work for me! Be sure to check out this link for More Grilling Inspirations! Whether you’re picking up ingredients for a homemade masterpiece or looking for a delicious meal solution without the prep work, The Fresh Market has everything you need to celebrate the season! 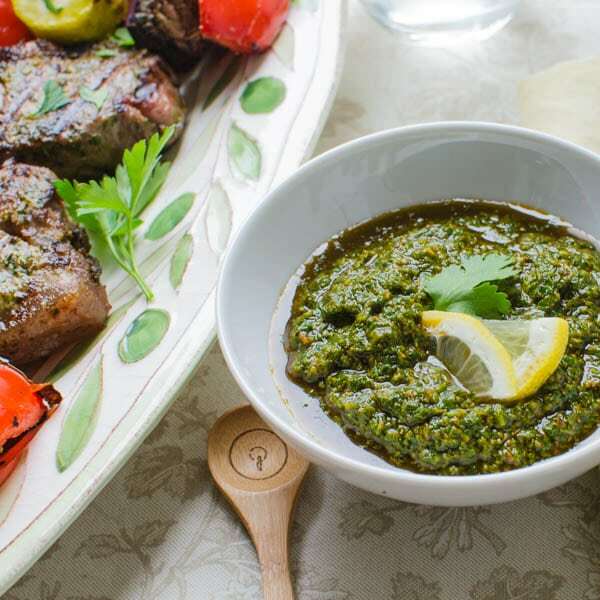 Start with a homemade marinade – chermoula sauce. I shared the chermoula recipe in this post. Use just a quarter cup of the sauce and thin it with some extra virgin olive oil to make a delicious New York strip marinade. 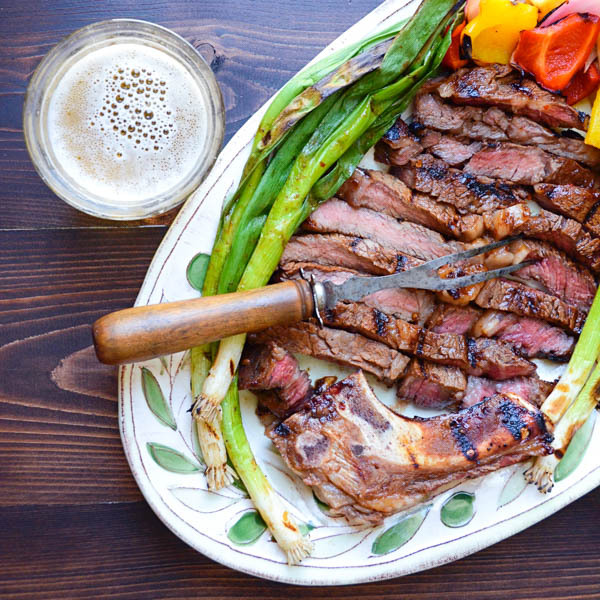 Marinate the strip steaks in this smoky spice blend for about an hour before grilling. Heat the grill to a medium high heat, about 450° – 500°. Grill the steaks for 4-5 minutes on one side without fussing with them – avoid poking, prodding, moving or adjusting the meat… just let it be. Flip the steaks and continue cooking until you reach your desired doneness. MEDIUM RARE: 3-5 minutes; Internal Temperature 135°. MEDIUM: 5-7 minutes; Internal Temperature 140°. MEDIUM WELL: 8-10; Internal Temperature 150°. Remove the steaks from the grill and let rest for 5-7 minutes so that the juices can redistribute throughout the meat. Don’t those steaks look amazing? I wish I had smell-a-vision so you could understand just how tummy rumbling this meal is. Scott grilled the ready-made vegetable kebabs alongside the steaks so they came out at the same time. By the way, that chermoula sauce is excellent on grilled summer vegetables too! 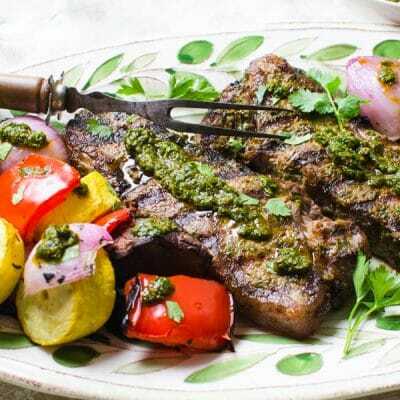 Spoon the leftover sauce into a bowl and serve it alongside your platter of grilled chermoula marinated strip steaks and grilled vegetables so that everyone can help themselves to this bold, flavorful blend. Doesn’t this make an inviting Memorial Day or Summer grilling spread? I think so, and I love how easy it is. Ten minutes to make the sauce, an hour of hands-off marinating time and just a few minutes on a hot grill and it’s a party. To round out the spread, pick up a ready made salad from The Fresh Market’s deli section and don’t forget the fresh flowers to make it festive and special. Tulips are my favorite. 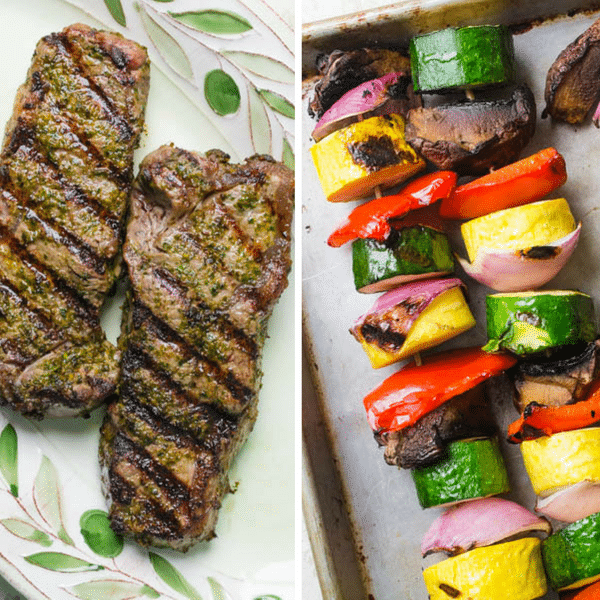 These marinated strip steaks are tender and juicy, perfect for celebrating this Memorial Day or for any summer soiree and remember, whether you’re picking up ingredients for a homemade masterpiece or looking for a delicious meal solution without the prep work, The Fresh Market has got everything you need to celebrate the season! And don’t forget dessert… The Fresh Market has an amazing bakery and pastry department, but I confess, these Almond Crispies are hands down, my favorite sweet ending to a summer grilling party. Bon Appetit! New York strips are always a winner, but when marinated in a homemade chermoula then grilled and then topped with extra sauce... well, you've taken this cut to a whole new level. In a small bowl combine 1/4 cup chermoula with the extra virgin olive oil until well blended. Reserve the rest of the chermoula for serving. Spread the steaks on both sides with the chermoula/olive oil mix and marinate for one hour. Transfer steaks to a platter and let rest for 5-7 minutes so the juices can redistribute through the meat. Serve with additional chermoula sauce. 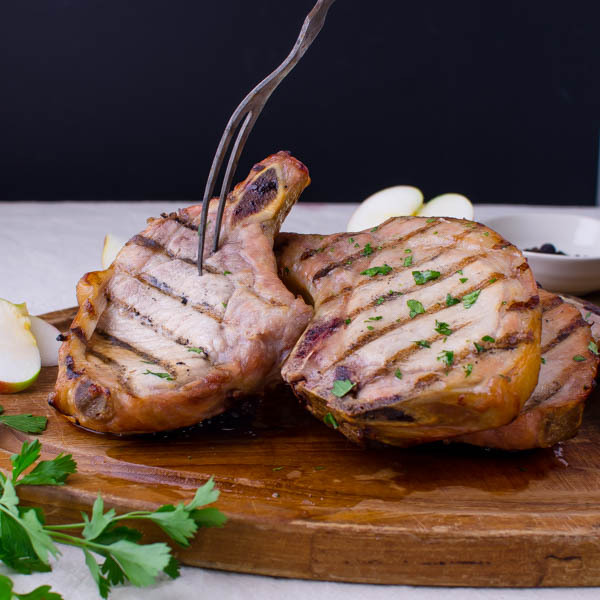 What a nice, simple recipe to kick off grilling season! I love chermoula sauce, especially with seafood, and I can imagine that it’s delish with steak as well. The Fresh Market is great. I always have a positive shopping experience there. Have you tried their Crispie cookies, Amanda? So delish! Just beautiful! I just recently heard about Fresh Market, but there isn’t one close to me. Oh well…. I think every place has some type of specialty market … cross your fingers and maybe you’ll get one soon! That really is a nice market. The vegetables are lined up so neat. I want to pick one of everything. It is wonderful that they pre-make those veggie skewers too. It’s so helpful! 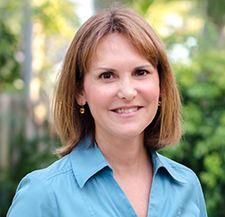 I agree Ginny – sometimes convenience foods are the way to go and they have a beautiful variety at The Fresh Market. I saw this on Facebook and immediately clicked through! I had seen your chermoula sauce and I want to make it just so I can slather it on steak, just as you did! Another delicious and fun recipe Lisa!! I think we have the same palate, Elaine! These steaks look gorgeous! Perfect to serve with colorful veggies this summer! That chermoula sauce sounds Amazing! I bet it would even be good with the grilled veggies as well. What a great recipe to serve for the upcoming holiday weekend!